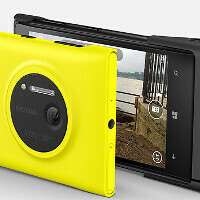 Nokia slashes price of Lumia 1020 in Europe: could this be in preparation for a new high-profile Lumia? Just moments before its April 2nd event, Nokia has slashed the price of its 41-megapixel, camera-centric Nokia Lumia 1020 by a large margin. You can now buy the Lumia 1020 for just €399 off contract from various dealers (in Finland), down from an earlier price of €495. In other European countries, the Lumia 1020 price has also gone down recently, and you can get it for around €450. The phone launched at a much higher original price, selling for $299.99 on a 2-year contract in the United States (you can grab it for $99.99 on AT&T now).